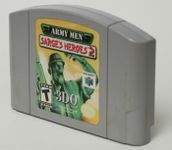 Another in the line of the Army Men games. Your job as a plastic army man is to complete missions and battle the other army. The tag line reads "Real Combat. Plastic Men"
The storyline continues from the previous game. General Plastro goes missing. With the help of a spy from the Blue Army, you must save him from permanent plastification.